When a gunman took three hostages at Discovery Communications headquarters (home of the Discovery Channel) on September 1, 2010, hundreds of news outlets reported the crisis. Yet mainstream media was not the first to break the story. An employee inside the Silver Spring, Maryland facility took a photo of an armed law enforcement official using a mobile phone and posted it on Twitpic. "Discovery Channel building" quickly hit the top of the Twitter trending list. From this one “citizen journalist,” Twitter’s viral power took over. Within seconds, people were learning about the ordeal for the first time through the micro-blogging site. 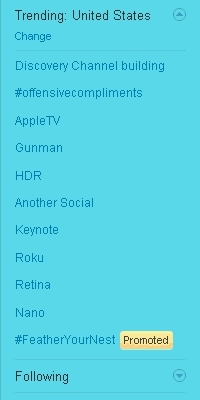 Before long, the “Discovery Channel building” became the top trending topic with “Gunman” not far behind. That was just the beginning. The rest of the day and evening, employees largely chose social media to let their families, friends and fans know they were safe. Likewise, those families, friends and fans commented back by the thousands on Twitter, Facebook and the company’s blog. Working with the police, Discovery Communications quickly evacuated 100 children in the onsite daycare center and 1,900 employees minus the hostages. Hours later, the hostage standoff ended with all employees safe when police shot and killed the gunman. Throughout the crisis, the communications team at Discovery carefully considered how to communicate with the public. They very deliberately chose not to post anything from corporate Twitter, Facebook and blog accounts. Discovery chose not to post on corporate social media accounts until the crisis was resolved. However, the company let employees inform their fans and followers that they were safe. 50,000 viewed the company’s blog statement in two days. Discovery reached employees and the public with news of the end of the standoff faster than traditional media could. Meanwhile, Discovery Communications specifically chose to let employees tweet and post as they desired after evacuation. Thousands of tweets and Facebook status updates went out from employees about their whereabouts, safety and the safety of the children in daycare. “There was a lot of anecdotal evidence of people saying, ‘I saw your tweet and knew you were OK,'” she added. Another employee shares that she’s safe, and updates her followers about the end of the standoff. After the hostages were free, Discovery collected all the facts before crafting an official statement on its blog thanking law enforcement officers and everyone for their concern. Then, they pushed links to that message out through Discovery corporate Facebook and Twitter accounts, as well as accounts for specific Discovery networks and shows. “We really wanted to address people who had expressed their concern,” Weiswasser said. Later, one of the hostages also posted his words of thanks on the corporate blog. More than 50,000 people responded with visits to the main blog post in just two days, compared to 23,000 blog hits the preceding three months. About 19,000 of those visits came from Twitter, where thousands retweeted and posted @ replies. On Facebook, over 14,000 new people "liked" Discovery Channel, generating 222 comments to the status update that everyone was safe. It was a level of direct interaction not possible just 5 or 10 years ago. Back then, Discovery Communications’ likely response would have been a press release – a one-directional message for the news media. Instead, Discovery and its audience interacted with two-way dialogue on the blog, Twitter and Facebook. And the important announcement about the end of the crisis reached the public and employees faster than through traditional media. 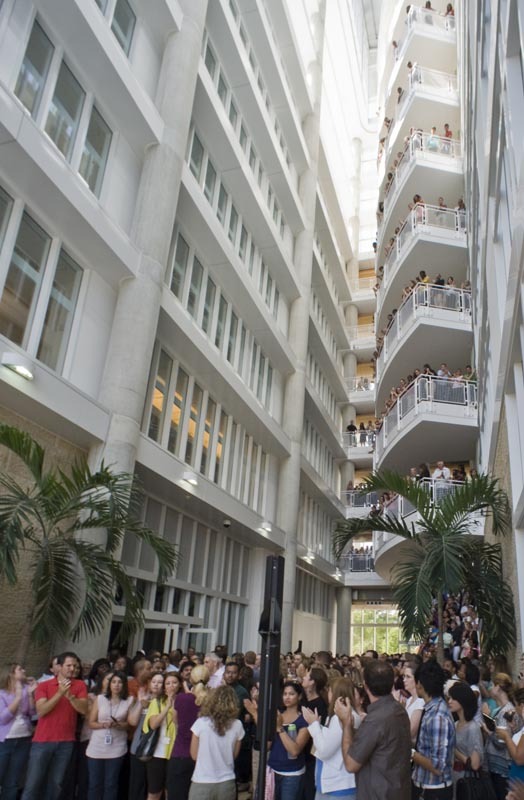 Employees gather in the atrium after returning to work (Photo: Ken Visser for Discovery Communications). No rogue posting – In a crisis, social media should follow in lockstep with your corporate communications plan. At Discovery, it meant corporate social media waited until the company was ready to make an official statement. Tell your people – Give your audience – in this case, employees and the public – an official message as soon as you safely can. “Even we were surprised by the volume of interest in the content we were posting.” Weiswasser said. Tap into the viral effect – Social media tools such as blogging, Twitter and Facebook all working together provided the fastest way to inform the greatest number of people. Does your company have a crisis communications plan in place? How does social media fit in? 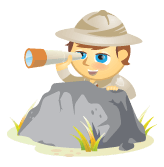 Any firsthand experiences of social media helping preserve your personal safety? Let us know your comments in the box below.